Ellie Anne Harvie (born April 7, 1965) is a Canadian actress who portrayed Morticia on The New Addams Family. Later, she starred as Dr. Lindsey Novak in Stargate SG-1 and Stargate Atlantis. Harvie was the youngest of five children born into a U.S. Air Force family. They eventually settled in Prince Albert, Saskatchewan. Harvie later attended the University of Manitoba, where she earned a degree in political studies. After graduating, Harvie moved to Vancouver with her family in 1987, where she took up a two-year course at the Vancouver Playhouse Theatre School. Her love of stand-up comedy and improv led to extra work in TheatreSports. After training at the Vancouver Playhouse Acting School, Harvie embarked on years of theatre touring British Columbia's schools with "Greenthumb Theatre", performing in scads of Fringe Festivals and then the big stages. As part of the Vancouver TheatreSports team, Harvie won the 1995 Just for Laughs Improv Tournament championship held in Montreal, beating competitors from across the world. Harvie also appeared in Cupid, The X-Files, Nightscream and The 6th Day. 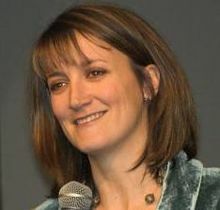 She received a Gold medal in CBC's 1998 Improv Olympics and a Gemini nomination for Best Comedy Performance in a series or Special. She also took over from Wendie Malick as Burdine Maxwell from the second TV season of Bratz. She portrayed Candace/Mrs. Bubkes on the YTV teen comedy series, Some Assembly Required (2014-2016 TV series). On November 24, 2012 Harvie hosted the inaugural UBCP/ACTRA Awards, which aims to honour acting talent in British Columbia. Harvie has, also, starred as Lillian Tibbett on Hallmark Movies & Mysteries Channel Series An Aurora Teagarden Mystery Series (2015-2018). This page was last edited on 4 October 2018, at 07:59 (UTC).